This home was built in 1906. This is an up and running Bed & Breakfast that we started from the ground up, opening April 1, 2015. We continue to accept reservations as we are going thru this process. This property is being sold as a turn – key operation. All furniture is included in the sale. 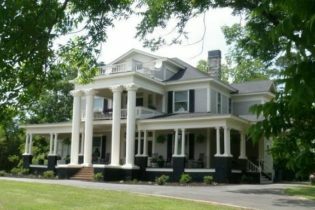 The name (Butterfly Mansion Bed & Breakfast), website, all guest information (including addresses, phone numbers and e-mail addresses are included). And all future bookings. There is an owners quarters located on first floor of home. There are 2 queen rooms and 2 king rooms with en’ suite baths and sitting area. This home is 5016 sq. ft. Sitting on 5.53 acres. Also included in the sale is an adjoining lot .65 acres. There is city sewer and water. Downstairs consists of : Large entry hallway, parlor, 1/2 bath, 2 dining rooms (set up for events) and a sunroom that could be used for guest space or owners sitting area. Also has a beautiful front porch. Owner’s quarters: Large bedroom/ living area, 1 1/2 baths, laundry room, office area, large eat in kitchen, storage room and a fenced in back yard. There is a large parking lot located in back of house that can hold approximately 40 vehicles. Many of our guests are traveling back and forth from FL. H&V: This is a local plant and we get their people coming in from others states to work. (some come and stay for a single night but most are here for 3 – 4 days at a time. Georgia fair grounds (located just 20 min north) There are events here all the time and we draw people from here. Warner Robbins Air Force Base: located just 30 min. from us. When our soldiers need a little R&R with their significant others they come and stay with us. Taylor Regional Hospital: Just right around the corner. Doctors coming in to work stay with us. Some are here for 1 week at a time. We have done small weddings and events not exceeding 40 persons. We have not explored bigger events. However, we are constantly asked for Weddings to be done outdoors, under tents for 100 plus people. This could be a very lucrative aspect of the B&B if you wished to pursue this avenue. Thank you for your interest and if I can be of further assistance please do not hesitate to contact me. Fully equipped, turn-key bed and breakfast. Located approximately 45 minutes from the Fargo entrance to the Okefenokee State Park, this residence has hosted numerous guests over the past 28 years. As the only bed and breakfast in the surrounding area of Fargo, Lakeland, Homerville and even Waycross, this charming home is ideal for the aspiring B & B owner. 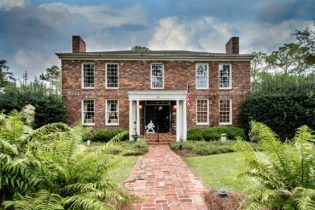 Located 9/10 of a mile from Homerville/US Highway 84, this two story brick home can tell many stories. Hand-selected heart pine boards for the flooring and original pine shiplap, plus mahogany trim and 3 fireplaces are just a few of the fine details. An inground pool, and quaint outdoor seating, make Helmstead the perfect place for relaxing after work or vacation adventures. This is considered a home-stay bed and breakfast. Detailed list of Furnishings and accessories to available to interested parties as needed.